...so help me, I did it. 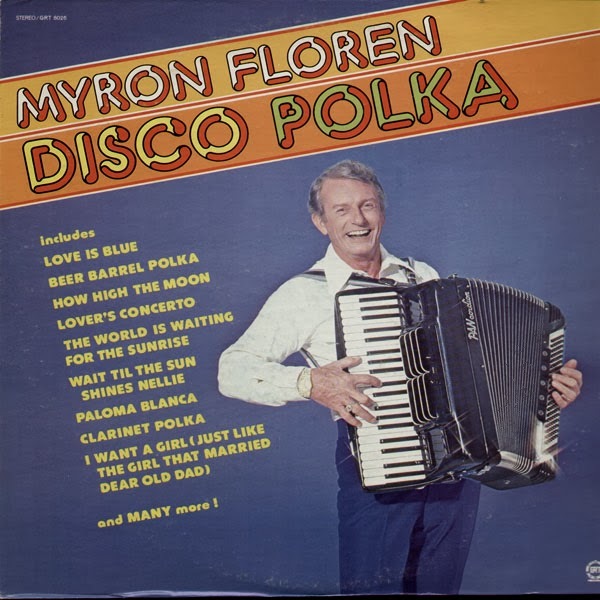 *hangs head in shame* I recorded the entire Myron Floren "Disco Polka" album, and *chokes* am releasing it from my laboratory onto an unsuspecting public. Have mercy on my damned soul! THANK YE! A vinyl copy of this one has been on my list of "wants" for a few years now, and this will do nicely until found! It's the " and MANY more " that I find so terrifying...Thanks! Ya oughta look up a couple Bobby Vinton 45s, "Disco Polka" (a disco-fied version of "Pennsylvania Polka,") and "Polka Pose" (the predecessor to Madonna's "Vogue" hit?). Jimmy Sturr put out a 2-Lp set still on my want list, POLKA DISCO. Myron Floren also put out a country/western accordion Lp on the same label as this disco album. That is amazing, windy. Can't believe there is actually more to this sub-sub-genre. I don't even think Brave Combo have done a polka-disco. But hey, maybe polka's a more versatile form than we think. There were some "rock" ones, e.g. : Annette Funicello's "Rock-A-Polka" and a novelty "Punk Polka" on an old Rhino comp. I waiting for death-metal polka. "am releasing it from my laboratory onto an unsuspecting public." I read that sixth word as lavatory in my initial scan of this post. Had to go back and check. At least ol' Myron can actually play. I always thought Mr. Florin had a quietly wicked sense of humor. This seems to bear out that suspicion. That Necronomaccordion video was great, but only 22 seconds long! And couldn't find anything else on the intar-webs about these guys. Hope they do put out an album. And I thought that the techno "Hardcordion " album was nutty. That's sounds incredible windy, looking forward to it. I know this post must be ancient history to you now, but I just want to say thank you for bringing this album into my life. It's brought me far too much joy. You're welcome. Brixton, but this post is not ancient history because disco polka, like all great art, is timeless. I just acquired this album. It was one of a bunch of albums an uncle in Nashville gave me. Can't find anything about it.. The album label has "Promotion Copy" on it, so maybe it was never released upon the general public (for safety reasons??). Anyway, the sleeve is a bit worn but the vinyl looks virgin. I've been putting it off for a few days, but this weekend am going to man-up and give it a listen. Side 2, Track #4: "The Cotton-Eyed Joe Disco-Polka." Dear god in heaven, I can't even begin to imagine what that sounds like. I don't think my record says "Promotion Copy" so it may have indeed been a regular release. Tho, like the 101 Strings' "Astro-sounds Beyond The Year 2000" album it may have baffled/alienated its audience.